Some are still balancing success with the stress of the Junior Cert. FOR A SMALL country, Ireland punches above its weight when it comes to success stories. And the future looks like more of the same. We’ve compiled TheJournal.ie’s 20 Under 20, to highlight amazing achievements and success stories from those still in their formative years. Many of the teenagers and young adults on this list won’t be leaving the sphere of public attention anytime soon. Of course, this list is not exhaustive, and we have allowed some of those just over the under-20 mark to slip on, as their success or achievements are unlikely to be limited to the first few months of their twenties. Let us know in the comments below who would have made your list. There are many more success stories, both on a personal and national level, out there. 2014 was a fantastic year for this 19-year-old showjumper, and he topped it all off by being named the Irish Independent’s Young Sports Star of the Year. He now lies 19th in the world rankings, and recently took home a top prize at the London International Horse Show. In November, during his first appearance at the top level of show jumping, he won the Italian World Cup class at Verona, RTÉ reports. When at the age of nine you’re the European Union’s Digital Girl of the Year, and end up teaching the Taoiseach his first lines of code, you’re probably one to watch out for. Lauren Boyle is the founder of Cool Kids Studio, an initiative with three websites that she has built. She mentors people through coding initiative CoderDojo, where she teaches Scratch, HTML and CSS. Two years ago, Louise was going through a difficult time and struggling with mental health issues. She got involved in her local youth council, Donegal Comhairle na nÓg, but never spoke at meetings because she didn’t have the confidence. Through the support of the Comhairle Co-ordinator and the other teenagers, the 18-year-old began to open up and got involved in their Sparks Mental Health Roadshow. In November, she shared the stage with the Taoiseach and spoke of her journey in front of 750 people at the 25th Anniversary Celebration of the UN Convention on the Rights of the Child. Jordan first caught the public’s attention when, at age 12, he appeared on RTÉ’s Junior Dragon’s Den with his games company Casey Games. Now 14, he is looking to expand his portfolio to more games and web-based applications, in particular a programme to help teachers monitor their students’ progress. However, despite the likes of Apple, Google, LinkedIn, and Twitter all expressing some form of interest in Jordan’s activities, he still has the small matter of the Junior Cert to take care of. Conor is tipped as one of the biggest up-and-coming fashion photographers. The 18-year-old picked up a camera on a whim when he was 14, and ‘something just clicked’. He has now worked with the likes of Brown Thomas, Topman, Oxfam UK and Tatler magazine. Originally from Dublin, he is now based in London. 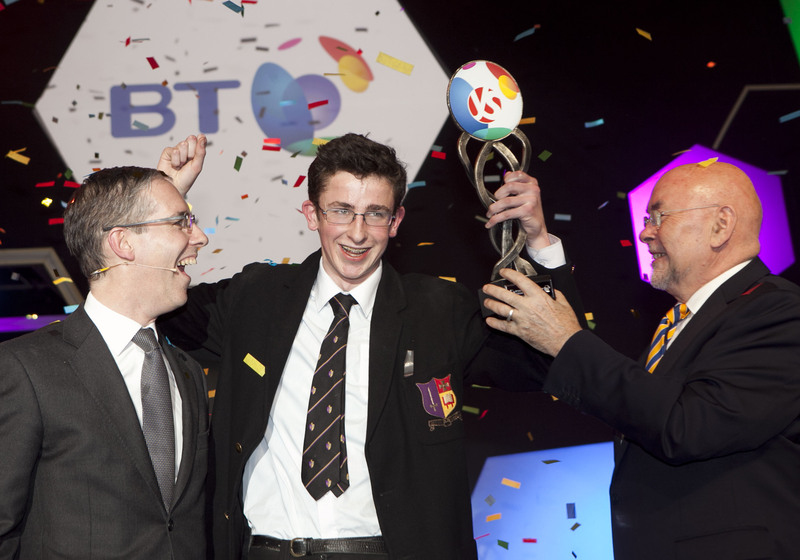 Paul won the top prize at the BT Young Scientist competition at the start of last year, aged 17. The achievement? Finding the answers to previously unsolved equations relating to graph theory. He said it is important to ensure people understood the massive impact such works of pure mathematics can have on our day-to-day life. At the age of 11, when most would be busy getting to grips with Angry Birds, self-taught developer Caolan released his first app onto the Android market. Albeit simplistic, it was a start, and he has now moved on to more complex projects. Three years later he has now turned his attention to NetSafe, to be featured in the BT Young Scientist competition. This programme monitors a child’s online activity, sending all information to their parents. Known as the Irish Messi, the 11-year-old’s soccer skills have attracted international attention. He grew up in Castleknock before moving to Australia due to his father’s work. He later began training for Barcelona at the prestigious La Masia academy. However, rumours circulated last month that he had been convinced to join Liverpool. She may have to undergo a few years of comparisons to Katie Taylor, but Ciara is already making a name for herself on the international boxing stage. The Mayo native was Ireland’s 2013 World Junior champion, and she took home a silver medal for Ireland in the Youth Olympics earlier this year. This 18-year-old Waterford hurler wasted no time in making a name for himself at senior level during his debut. His point against Cork earlier this year has been hailed as one of the best of the season. Previously, Austin was centre-back for the Waterford minor side that won the All-Ireland last year. Having been diagnosed with depression at the age of 13, Jamie now works to promote positive mental health with TeenLine, a free-phone mental health service for teenagers. He has also gained a fairly sizable following on Facebook. Jamie is currently a TeenLine Champion, working to spread awareness of the charity’s work. Earlier this year, Adam (19) was awarded the Social Entrepreneurs Ireland Elevator Award for his new Irish charity asIam.ie. The website is aimed at helping the public learn more about autism spectrum disorders, as well as helping to empower those diagnosed with the condition to reach their full potential. Adam, who was diagnosed with autism himself, has said there is a lack of “true understanding” of the condition. Oh, and he’s Minister Simon Harris’s younger brother. Okay, yes, we know, this entry is three separate people, but they jointly came out on top against competition from around the world to win the 15-16 year-old category at the Google Science Fair. Their revolutionary project on bacteria and cereal crops was heralded as a “stellar achievement at this global competition”. Harry (16) is founder and MD of KidTech, a company aiming to teach more young people how to code. He plans to take the courses and workshops to a national stage – Ireland’s methods of teaching computer science just aren’t up to scratch, he says – and then even expand internationally. At the age of 14, building a small nuclear fusion reactor isn’t really top of the agenda for most people. Tom has thrown himself headfirst into the challenge, and raised €10,000 in funding for the project. His plan is to enter the 2016 BT Young Scientist Competition with a range of experiments involving the complex device. Joanne (18) has become a household name in Ireland. She first came to public attention when Enda Kenny made a promise to her not to cut disability funding if he was elected (something which the Government subsequently did, and then reversed). She has been open about life with Tetra-amelia syndrome, and has even addressed the United Nations on how technology helps her in everyday life. A documentary about her life, No Limbs No Limits, has ‘inspired a nation’, she believes. Joanne is now studying Criminology in UCC. Bridie Monds-Watson is an 18-year-old singer/songwriter from Derry in Northern Ireland who, despite only picking up a guitar five years ago, was named as a BBC Music Sound of 2015 and by Spotify as a spotlight artist, as well as picking up a Meteor song of the year award. She is definitely one to watch out for in the coming year. Saoirse is already a familiar face to many, co-staring in Atonement and going on to become one of the youngest actresses ever to receive an Oscar nomination. The 20-year-old has also picked up nominations for a BAFTA and Golden Globe, making her unlikely to disappear off our screens any time soon. You don’t need a world-changing concept or groundbreaking piece of code to make an impact before you’re an adult. Irish Baubles is an example of a teenager taking a simply idea and running with it, turning it into a business. Ciara established the company from Wicklow in 2011 when she was just 16, and began designing and selling landmark-themed baubles. Since winning the National Student Enterprise Awards, she has grown the business to supply the corporate, wholesale and wedding markets. Adam is Ireland’s youngest politician, and was co-opted to a seat on Waterford City Council last year following the sudden death of his father Gary. He went on to contest the local elections and retain his seat. The Fianna Fáil politician said at the time the election was not just about representing his community, it was about continuing the work his father did in the area for many years. An honourable mention must go to two Sinn Féin councillors – Jonathan Graham, also 20 but a few months older than Adam, and Lisa Marie Sheehy, who became the youngest female politician in Ireland when elected in May and turned 21 last month. Email “20 Under 20: Ireland's brightest and most inspirational rising stars”. Feedback on “20 Under 20: Ireland's brightest and most inspirational rising stars”.